This version of Appian Cloud is not available to new customers. Appian provides a complete cloud Business Process Management (BPM) solution. Offering native mobile apps for iPhone, iPad, BlackBerry and Android, Appian gives users mobile access to process events, tasks, actions, and social collaboration. Appian is a scalable enterprise BPM solution that can grow from a single project to your entire enterprise process needs. With its 100% web-based interface and scalable architecture the Appian BPM Suite is an ideal environment to deploy as a service in the cloud. With the same functionality as traditional on-premise BPM software deployments, Appian in the cloud provides a powerful way to accelerate your process improvement initiatives. The benefits of deploying Appian in the cloud include low startup costs, fast deployment with no manual maintenance, predictable costs during the life of the application and fast return-on-investment. Appian's cloud BPM deployment provides reliability and security that can be tough to match by even the best internally managed environments. There is no compromise when choosing to deploy Appian in the cloud. 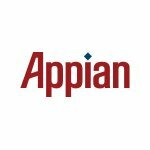 Appian is designed to meet the needs of enterprise customers with the necessary reliability and security guarantees in place. If you require assistance, please log in to Appian Forum to search the Documentation, download product updates or discuss with the community. Alternatively, you can contact our technical support team directly.